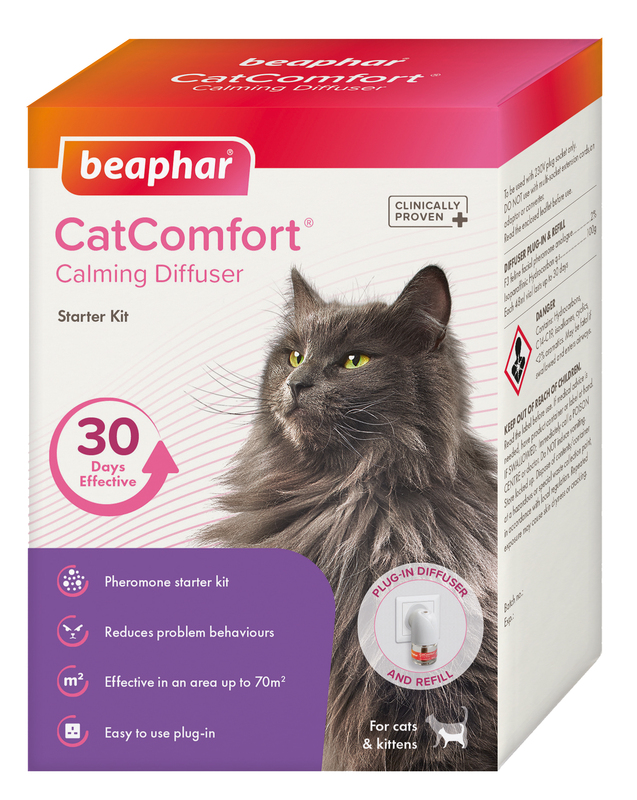 Restore the calm, stress-free atmosphere to your home with the Beaphar CatComfort® Calming Range. Beaphar CatComfort® uses pheromones which are recognised by your cat, and are clinically proven to promote feelings of reassurance and help reduce unwanted behaviour. By using Beaphar CatComfort® you can help your cat feel at ease anywhere. Ideal for use all year round, and suitable for everyday stresses and events such as fireworks, Beaphar CatComfort® is an effective range of easy to use products. The pheromones used are clinically proven to promote feelings of reassurance in cats, and are particularly useful for cats suffering from anxiety, stress and changes in their environment. Have you taken the Cat Calming Quiz? Click to have a go! Pheromones are the invisible markers left by cats to mark an area as a safe, comfortable space, and are often associated with feelings of reassurance and happiness. Leaving these markers is your cat’s way of forming a positive connection with an object or space. Many cat-owners will recognise this behaviour, as cats often rub up against their owners and household objects. By doing this, your cat is releasing pheromones and marking the area as a ‘safe-space’ which is comfortable for them to be in, and identifying you as a person they are comfortable and happy to be around. When a cat feels comfortable and reassured, they are less likely to exhibit problem behaviours such as vertical scratching or spraying. Using pheromones recognised by your cat, the Beaphar CatComfort® Calming Diffuser is a simple way of helping your cat feel at ease and reducing common behavioural problems around the home, such as inappropriate vertical scratching or spraying. 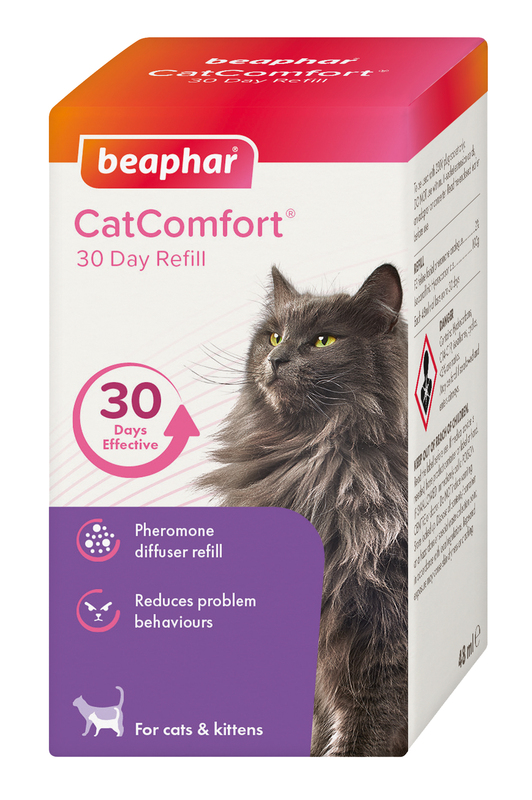 For continuous reassurance, use the Beaphar CatComfort® 30 Day Refill. Each refill is effective for up to 30 days, making Beaphar CatComfort® a simple way to provide a long-term solution to reducing your cat’s general feelings of anxiety and preventing problem behaviour. Beaphar CatComfort® Calming Spray is ideal for use around the home and while travelling. Spraying on your cat’s bed will help your cat feel settled and reduce problem behaviour, and it can also be used in cat carriers. Long-journeys and visits to the vets or catteries can be a stressful experience for cats, so spraying the inside of the cat carrier 15 minutes before the journey will help your cat feel less anxious. and find out how Beaphar CatComfort® has helped her feel more at ease. Watch our videos to find out more about Beaphar CatComfort®. "I originally bought this to help settle my cats into our new home, but now I wouldn’t be without it. The diffuser is really simple and easy-to-use, and the handy refills mean that I can keep it topped up all year round. Having it plugged in all the time also helps our cats stay calmer during unexpected events like thunderstorms." "The Calming Spray makes visits to the vets much less stressful for both my cat and me! The thought of trying to take my cat anywhere used to fill me with dread, but this spray has really helped. Gone are the days of constant meowing and clawing at the sides of the carrier. The spray is really simple to use and has taken a lot of the hassle out of travelling."